Don Berwick, who left his job last week as head of the Medicare and Medicaid programs after sustained opposition from Senate Republicans who accused him of supporting rationing, struck back Wednesday with a blistering attack on his critics. “The true rationers are those who impede improvement, who stand in the way of change, and who thereby force choices that we can avoid through better care,” Berwick said in a farewell speech in Orlando. “It boggles my mind that the same people who cry ‘foul’ about rationing an instant later argue to reduce health care benefits for the needy, to defund crucial programs of care and prevention, and to shift thousands of dollars of annual costs to people — elders, the poor, the disabled –who are least able to bear them,” he said, according to a copy of his remarks. Berwick didn’t specifically cite congressional Republicans but clearly was referring to Republican proposals to make drastic changes to Medicaid and Medicare to reduce the nation’s budget deficit, such as capping annual federal funding to states for Medicaid. That proposal could result in billions of dollars in cuts, which critics have said would lead to cuts in benefits. 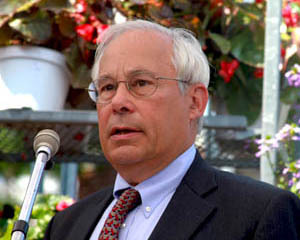 Berwick made his comments at the annual conference of the Cambridge, Mass.-based Institute for Healthcare Improvement, which he led for nearly 20 years before becoming administrator of the Centers for Medicare and Medicaid Services in July 2010. After Republicans said they would not confirm his appointment, President Obama appointed him during a congressional recess, which would mean he could serve only for 18 months. His last day was Dec. 2.